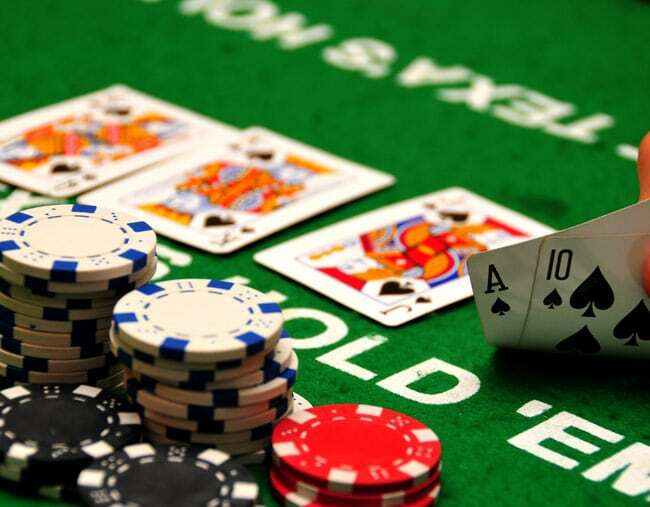 Poker rooms at online casinos make it as easy as possible for you to learn how to play poker. But lets take a look in more detail at the game of texas hold’em as this is currently the most popular poker game available. 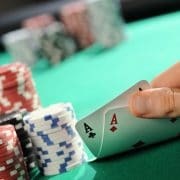 You’ll learn about key elements of the game, namely the Blinds, the Flop, the Turn and the River. In next to no time you’ll be playing just like a pro! Before any of the cards are dealt, two blind bets (small blind + big blind) are placed in the pot by the two players to the immediate left of the dealer. The blinds are put in to start the action. The player left of the dealer bets one half of the lower limit (small blind.) The player who sits left of the small blind, wagers an amount equal to the lower limit. When playing online this will be automatically done for you. Blinds represent the stakes of a table you are playing at, so on a table with blinds of $0.05 cents and $0.10 cents the average pot of money that you can win will be around $0.50 to $2.00 if you play at a table where the blinds are $1.00 and $2.00 the average pot could be around $10.00 – $30.00 picking the right level of blinds to play at is very important – stick to tables with low blinds when you learning and move up a level when you feel conformable you can hold your own. Normally the lowest level of blinds is $0.02 and $0.04 about 1p and 2p in English money. The highest blinds can go up to $150.00 and $300.00. Players are dealt two down cards (hole cards) the action starts with the player to the left of the Big Blind. This player can fold, call, or raise. Action continues around the table with all the players making one of these decisions. You cannot “check” (make no bet) in the first round, as blinds are active bets. lots of new players love to play any face card, thinking that a king is pretty good! now lets say you get lucky. You make a pair of queens on the flop. Now you have 5 players still in the hand and you – betting starts and there’s a few high raises – you think you have a good hand so you keep betting. Then the turn and river comes. example shown below. You’ve already thrown a lot of money at this hand and you can’t bear to let it go. But it’s impossible to see how you could win even with your pair of queens, anyone holding an ace has you beat, anyone holding a queen and anything higher than a 5 has you beat! Plus with 3 diamonds on the table there is a danger of someone holding a flush too. Choosing your starting hands is crucial to playing good poker – we’ll take a look at the best and worst starting hands later in the guide. After the first round of betting, the dealer then turns over 3 cards face up on the table (known as “The Flop”). This is the second betting round when you have the choice to check, fold, or raise. The player to the left of the button acts first. A player may now check if there is no betting in front of them. If there is betting and/or raising in front of them, they may call, raise, or fold. This is when your table position can be a great advantage, pro players love to talk about ‘table position’ table position is the proximity you have to the last person to act in the rounds of betting. Basically, if you are the last person or close to the last person to act on a table, you have a strong advantage over other players – how so! you might ask? well lets take the the example above, remember how you were dealt a K – 6, and remember how I showed it wasn’t a great hand. If you held the last table position to act you then have the chance to see how all the other players are going to act before you have to make a decision to play your hand. Lets say you’re in late table position and 4 out of 5 other players fold, you are now heads up with just one player. Your hand of K – 6 now becomes a stronger hand than before. The odds are tilted in your favor with just one person calling, if 5 players callers your K – 6 statistically would be much weaker. But against just one player you have a good shot of taking the pot. Using your late position you could raise before the flop and try and force the last remaining player out. If you get called you still have a fairly decent hand. After the the action on the “flop,” the dealer turns over another card (known as “The Turn”). This is the 3 round of betting. (In Limit Hold’em, the amount bet doubles on “The Turn”). The betting again starts with the player closest to the left of the button. If you have picked up the best hand on the flop you should make sure that players with drawing hands (incomplete hands that still need an extra card or two) aren’t seeing the the ‘turn’ for free. If they are going to see another card make them pay to see it! don’t allow them to build a hand for free. If you’re on a drawing, then try to see it as cheaply as possible! Following the completion of action on “the turn,” the dealer turns over the last card (known as “The River” card). This is the final round of betting. Very few players are going to fold once the river has been dealt (espeacilly if the blinds are cheap) they may of already commited lots of chips to the pot by this stage, so bluffing on the river should’nt be considered. This can work in your favour when you have the best hand! The showdown is when two or more players have finished all the betting and the remaining players cards are shown. The player with the best 5 card hand made from the two hole cards and the five table cards wins the pot. If players have the same winning hand, the pot is split equally between them. And that’s how to play poker… If you’d like to read more about playing poker then try my poker tips page, lots of advice from the professionals of the poker game. if you feel you’ve learn enough about poker to start playing then try William Hill Poker online, they have a great range of tables and some nice bonuses for new players.